Odometer, trip time and total mileage. Luna is the first to offer this new brand new horizontal display made from the same factory. 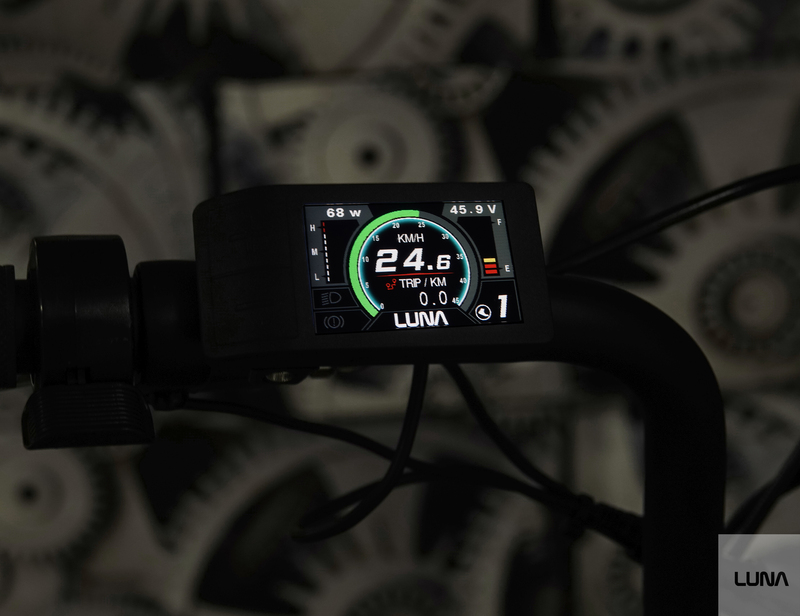 We have been trying for a small display for years that makes the ebike more discreet and at the same time offering the same functionality as larger more bulky displays. We believe real estate on your bike is your most precious valuable commodity. 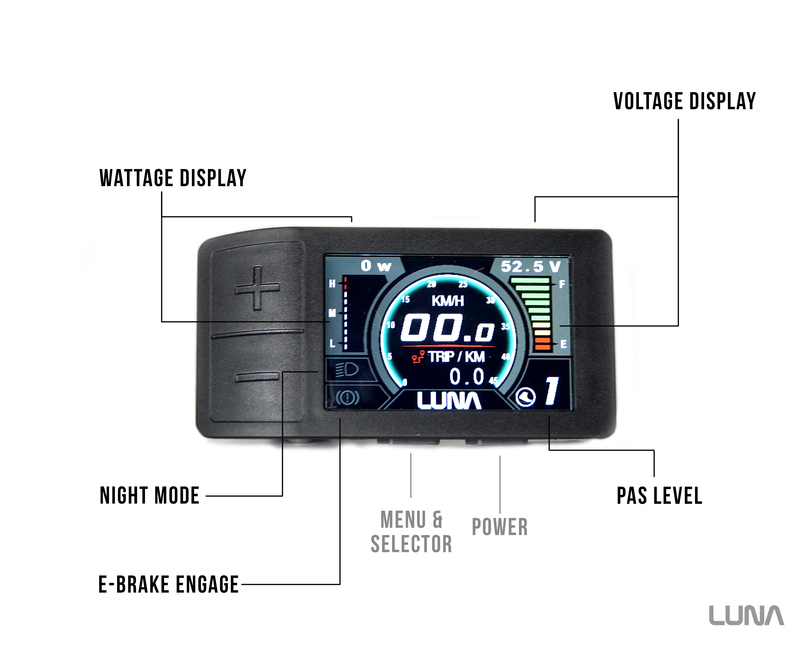 Cleverly designed to include the most important information in a completely compact size, this is Luna's first single piece display (integrated buttons) that fits perfectly on one side of your handlebars. This is a newer and smaller version of our popular 750c display (see it here), and because of its extremely small footprint, it can be creatively mounted anywhere you can think of (though Luna highly recommends the left side). Aesthetically clear and to the point, this display uses the classic styling of auto speedometers and the tiniest bit of color for a pleasant mix of a minimalist and futuristic feeling. This is our favorite display of all time. The display can be set for 24 to 52v battery and also includes a nice colorful touch in all of the gauges that presents the data very easily in a way to process quickly. Also the volt display is accurate in voltages over 55 which none of the stock Bafang displays have the ability to do. Please note this is for the voltage display only, not the gauge which can display for only up to 48v nominal. Click here for a handy reference chart to see how voltage relates to state of charge for 52v nominal packs. We recommend printing this out and keeping it on hand first few rides until you have memorized what voltage equals charge percentage for 52v batteries. Another surprising upgrade was the new haptic feedback that is found on most cellphones and video game controllers. When you press any button you now feel a small vibration confirming contact and response, which is is usually important when trying to multitask while biking. It may not be clear that this has a protective film on the display to prevent scratches during shipping, but it does. To peel back, run a fingernail across the plastic a few times to pull it up. This is the display to get. Much simpler without the separate switch of the others. Fits tidily just inside the left brake grip. It ends up clearing a ton of space from the bars and letting you have the center section for your phone or a decapitated zombie head. The form factor is great, this is really the right size, no problem operating with heavy gloves and I can read it with my 20/80 vision no glasses. But niceandtinyverytightpackage. I'd give it five stars, but using my throttle lever gets inaccurate low readings from the watt meter side, which is weird. Only when I start jamming on the throttle though, set a power level and crank and it reads as expected.